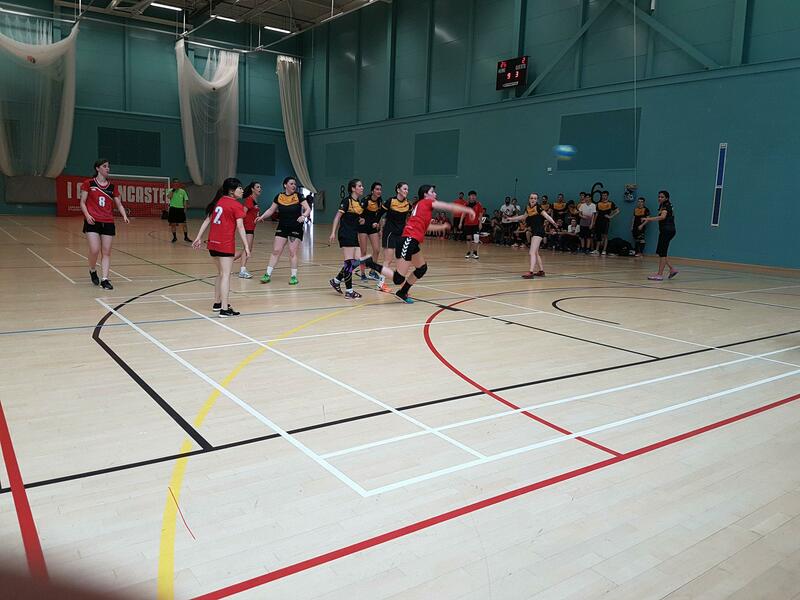 An assured performance by Lancaster delivered a landslide victory in the women’s handball, in a result that was never looked to be in question. The tone of the game was set within eight minutes of the opening whistle; after a few minutes of inconclusive skirmishes and tentative attempts on goal, Lancaster’s #5 scooped up the ball as it deflected from the goalkeeper’s outstretched arms, scoring in a mighty leap. From then, York was on the back foot. A valiant counter attack from York twelve brought the score close to level at only one point behind, but that was the closest the Whites came to reclaiming their initial lead. After repeated goals from Lancaster’s #13, the Lancastrian Team sat at double the visitors score as the half time whistle blew. In the second half, the goals piled up on the side of the Lancastrians. A flagging Yorkist defence was unable to hold off the forces of the red rose, who dominated play in the Yorkist half. Passing between each other in a half-ring around the goal, Lancaster were able to pick their time to shoot, scoring again and again. Several ragged offensives were seen off by effective goalkeeping from the Lancaster side, and for York it felt like a moral victory when they managed to pull back their score back to half of that of Lancaster. From there Lancaster cruised to victory. A confident performance, and one where it seemed that confidence was warranted – the final score was 20 to 7.